Reading this book is a truly magical and uplifting experience that should not be missed. Read it today! This book is also available as a part of a story bundle under the name The Delilah Dusticle Adventures. 5.0 out of 5 starsDelightful ! Eliza Bluebell comes to town. She is unique, her shadow is her best friend. Together she and her shadow open a sweet shop and the whole town is in awe and happy. An original and fun story with lovable characters and magical happenings. A pure delight for middle school readers and adults young at heart. 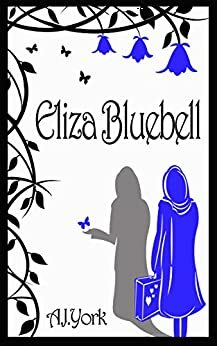 I highly recommend Eliza Bluebell to all. Also recommended Delilah Dusticle and Delilah Dusticle's Transylvanian Adventure also by A.J. York. Eliza Bluebell has a special talent; her shadow is a separate entity and is invisible to all bar Eliza. When Eliza and her shadow arrive in Blossom Brook they begin running a tearoom on the high street. On the side, Eliza and her shadow help members of the community with any problems they might be having. This is a delightful chapter book! Some magic and humour, and a lesson that helping others can be very rewarding. The language is simple with short chapters, perfect for younger children. Each chapter began with a black and white silhouette illustration of the main theme of the chapter. The flow of the story was very smooth without the interruption of illustrations within the text. I love the cover of Eliza Bluebell too, it’s so simple, yet striking. Eliza is a bit like Mary Poppins, arriving when needed, and leaving quietly when she is no longer required. She is kind and gentle, while her shadow is quite cheeky. I really liked grumpy old Mr Groop, with his sour expression and insistence on telling the bus driver how late the bus is running. I’m glad someone was able to cheer him up though! Eliza Bluebell is suitable for lower and middle primary school students. It would make a great read for early independent and reluctant readers, as well as being a nice story to share. I liked this story very much, and I hope there will be more Eliza Bluebell adventures in the future. This was a very sweet novella! It is touching and heartwarming to see how Eliza helps each of the residents of Blossom Brook, from the young to the old. Eliza has a bit of magic in her; her shadow is its own person, and Eliza is great friends with it. When she arrives in Blossom Brook, she fixes up a dilapidated old shop and turns it into something wonderful and new and improves everybody's lives. I enjoyed Eliza's kind disposition, as well as the interactions between her and her shadow, not to mention the interactions with the townspeople. In each chapter there was a person who needed assistance, and you got to see how Eliza helped them. Each person had a different problem, but each received an equally good solution. Each chapter is a story in itself, and you can read one without having any cliff hangars thrown at you, which, for this story, works. I would definitely recommend this one, and it should appeal to both children and adults alike, as long as the adult in question doesn't mind a simple, easy read. 5.0 out of 5 starsSimply Magical!